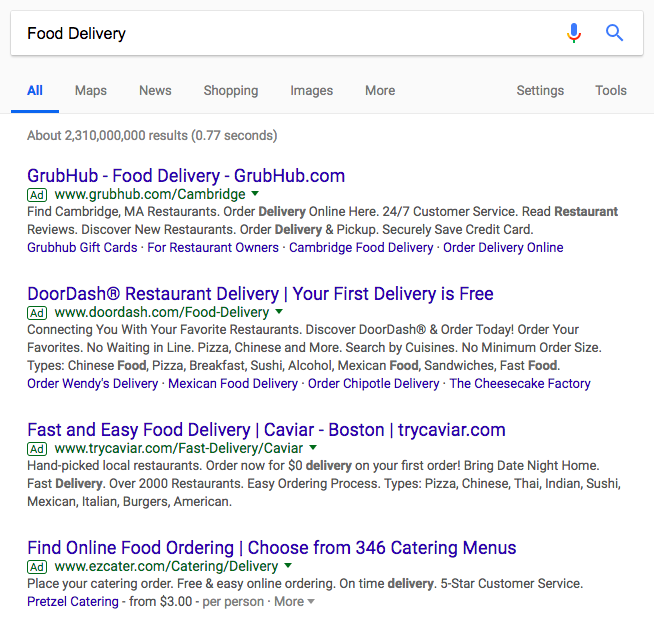 When most people think of advertising on Google, they picture the text ads that show up at the top of Google’s search engine results pages. But Google actually has another advertising program that they released three years after Google Ads’ inception. It’s called Google AdSense. Below, we’ll go over the main differences between Google Ads and AdSense, from whom they’re geared toward, how their bidding works, and how much money they can make and cost you. Read on to learn more. The difference between Google Ads and Google AdSense is that Google Ads is a program that lets advertisers display their cost-per-click advertisements on relevant Google search results pages and a network of their partner sites. Google AdSense is a program that lets web publishers open up small portions of their website for the same advertisers to display their ads on. While the Google Ads program is geared toward attracting advertisers, the Google AdSense program is geared toward attracting publishers. 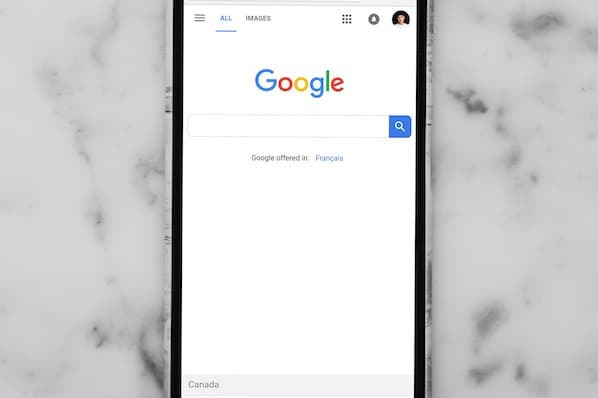 With over 3.5 billion search queries on Google everyday, Google Ads is one of the most popular and effective types of online advertising. Naturally, there’s enormous demand for the top ad rankings, so Google triggers an auction anytime there are at least two advertisers bidding for keywords that are related to search queries that users consistently enter into Google. 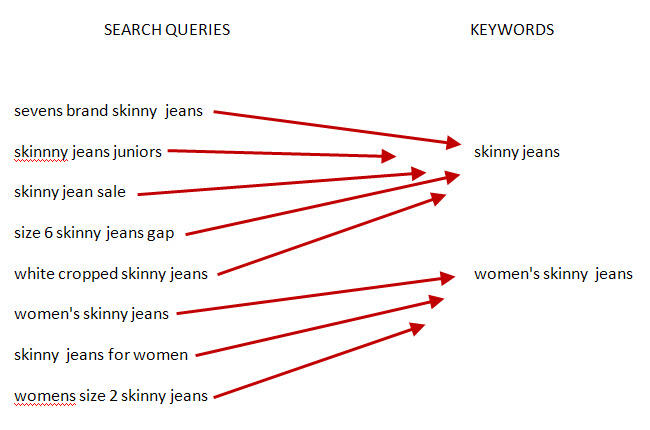 Advertisers can then categorize keywords and their corresponding ad copy and web page into groups, pick the group they want to bid on, and choose their maximum bid. 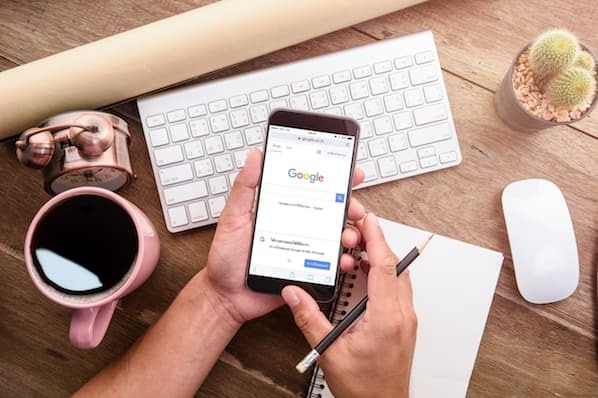 Next, Google will select a keyword from the advertiser’s ad group that they deem most relevant to users’ search queries and enter it into the auction. A Google auction isn’t like your typical auction for antiques, though. They want to level the playing field when it comes to leveraging the size of their reach, so instead of the highest bidder always winning the auction, the bidder with the highest Ad Rank always wins. 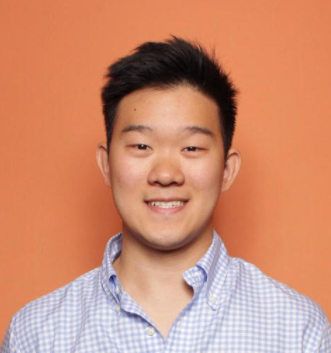 AdRank is calculated by multiplying your maximum cost-per-click bid with the quality score of your ad, which is calculated by measuring your page’s relevance to the keyword, user experience, and click-through-rate. This means organizations can’t acquire the top ranking for any keyword they want just because they have the biggest ad budgets. Their content has to be engaging. Google AdWords wants to incentivize the best advertisers to advertise the best content on their search engine results pages, so they reward ads that have high quality scores with higher ad rankings and lower cost-per-clicks. In the same vein, they also want to discourage bad advertisers from advertising bad content, so advertisers with low quality scores will usually only acquire a high ad position if they pay a huge cost-per-click bid. If they want to pay lower a cost-per-click, they have to settle with stooping at the bottom of the ad rankings. 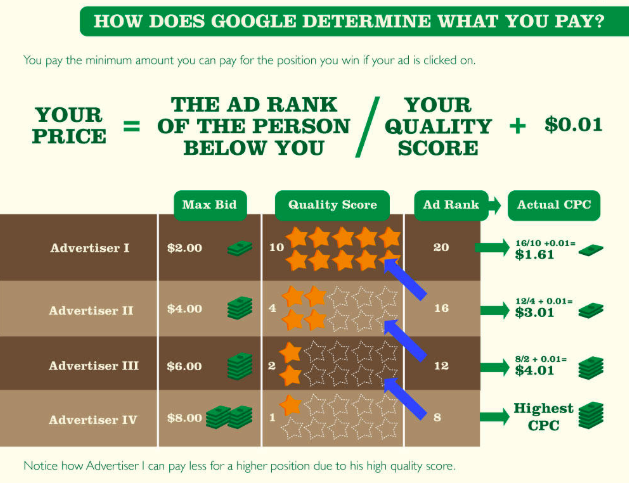 If you win a Google auction, your actual cost-per-click is calculated by the second highest ad rank divided by your quality score, plus one cent. The only time you’ll pay your maximum bid is if you’re the only bidder in the auction or if you make the highest bid in the auction, but you have the lowest ad rank. In this case, you’ll acquire the last ad rank. Just like Google Ads, advertisers bid on publishers’ ad space in the Google Ads auction. They bid on certain keywords, and if a publisher's content has the same or similar keywords, Google will sell their ad space to the highest bidder and pay the publisher a small portion of the bid whenever people click the ad on their website. However, AdSense doesn’t optimize the ads that they display on publishers’ website for a maximum return on investment like Google Ads does for its advertisers when they want to optimize their ad campaigns. So, essentially, the amount of money a publisher can earn with AdSense hinges on how well advertisers can craft their ads. Publishers do have control over the types of ads that display on your website, though. 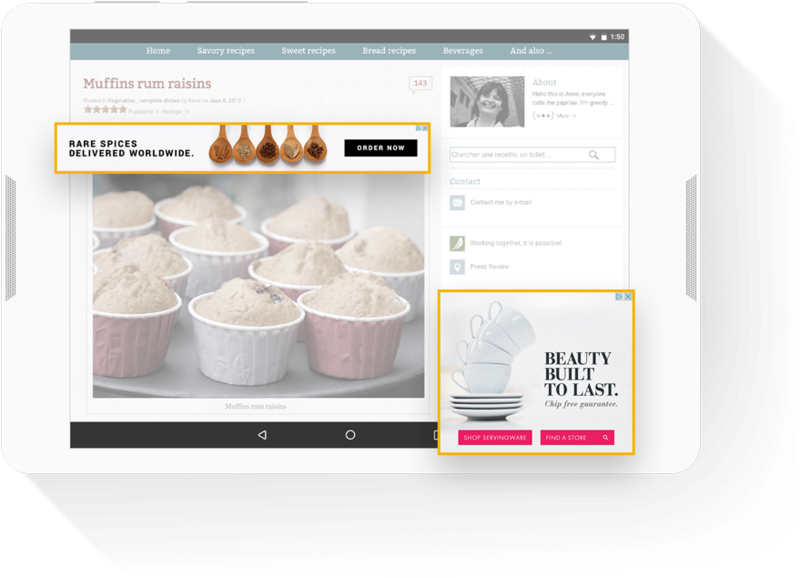 They can choose from text ads, display ads, rich media ads, and more. They can also customize their ad’s style or create their own, which gives them the ability to change the size, color, textual, background, and border details of the ads that display on their website. Additionally, they can only place three content ads, three link ads, and two search boxes on each of their web pages. If you want to sign up for the Google AdSense program, submit an application here.